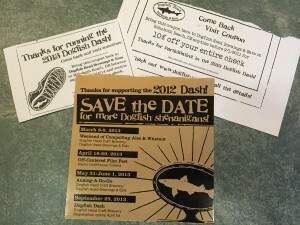 September for the beer nerd may herald the welcome return of fresh festbiers and pumpkin beers (presuming you weren’t already tripping over them in the shops in July or August), but for me, it just means one thing: it’s Dogfish Dash time. Now in its tenth year, the event has grown from a casual, friendly run around a portion of the Junction-Breakwater trail and a stop in Dogfish Head’s Rehoboth Beach brewpub afterward, to quite a competitive event beginning and ending at the brewery in Milton – and the competition starts with simply scoring a bib. 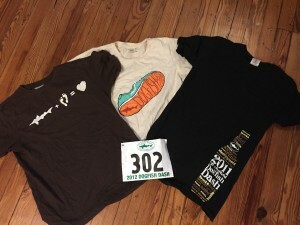 I ran my first Dogfish Dash in its second year, and will be back this time for my eighth; I had to break my nearly-perfect streak last year as I was Far Too Pregnant to run. Despite missing a year, I seem to have amassed a larger-than-expected collection of Dogfish Dash ephemera: not just t-shirts and race bibs, but semi-forgotten unredeemed coupons, water bottles and the odd blog post (or two, or three). It seems strange to think now that it was possible to fit most of the runners and their friends and family into the brewpub, with (relatively) minimal waits for beer, but as the Dogfish Dash has grown, the art of getting an ever-increasing number of runners to their beers has evolved and improved over time. Yes, some years had very long lines, but that’s simply incentive to try to finish in good time, and it’s clear that lessons are learned and applied to line management the following year. 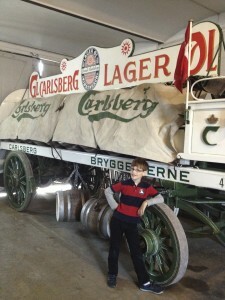 The other advantage of staging the race in Milton is the opportunity to tour the brewery; it seems there’s an entirely new portion each time, and the organization of the mini-tours has been top-notch. 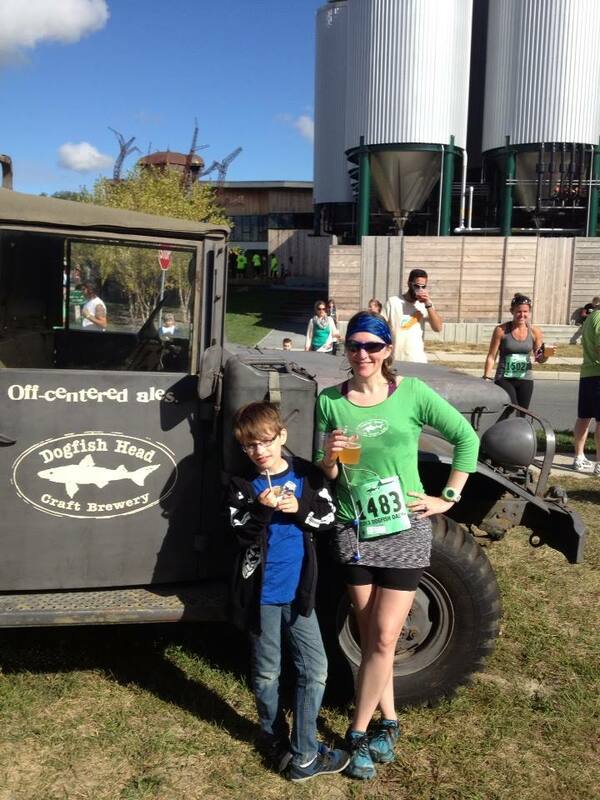 My now-10 year old looks forward to the race every year just for the tour; while he’s probably toured more breweries around the world than most adults, Dogfish Head is the one he sees annually, so he enjoys noting the changes (and donning the safety goggles). The staff members do an amazing job of moving large groups of people safely through the brewery, and the volunteers keep the beer flowing outside with plenty of enthusiasm. It’s also great to see the returning runners, both before and after the race: there are regular groups of costumed teams who seem to have better beer-related themes each time out. I’ve developed my own strategies around registration and packet pickup over the years – though it’s worth noting that while it seems it was ever thus, there was no great rush to sign up for the first few years; you could take your time and see how you felt a few weeks out. It’s true you do need to schedule yourself to register and collect your bib and other goodies, but given the popularity of the race, it’s to be expected. That said, it’s quite reasonable to cap the number of runners, even with a race for charity; anyone who has ever run in a huge event like the Broad Street Run or one of the many Rock & Roll half-marathons knows that a huge wall of people in front of you, fast or slow, isn’t the most inspiring running experience. And given that the race goes through Milton, which no one would accuse of being a large town (though it is a town of considerable architectural interest), there’s only so much room on the course. And I hear rumors that the backlog at the bridge – a familiar, if minor, issue for anyone who has run this race in the past – won’t be an issue this year with the change in distance and route. That brings us to another point; when those changes were first announced, there was the expected grumbling on Twitter about the loss of the 10K, while others lamented the lack of a 5K – it was too short for some, while too long for others who had hoped to make it their first race. 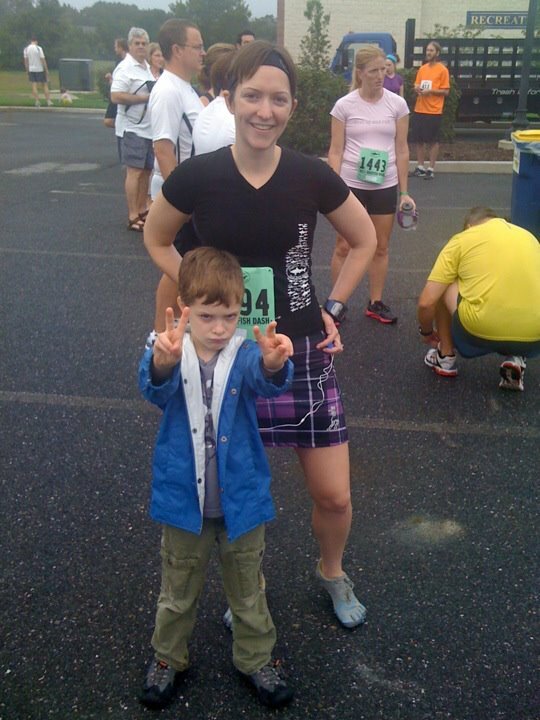 For both, I’ll offer my perspective: the Dogfish Dash is what made me become a ‘real’ runner, and it can do the same for you. 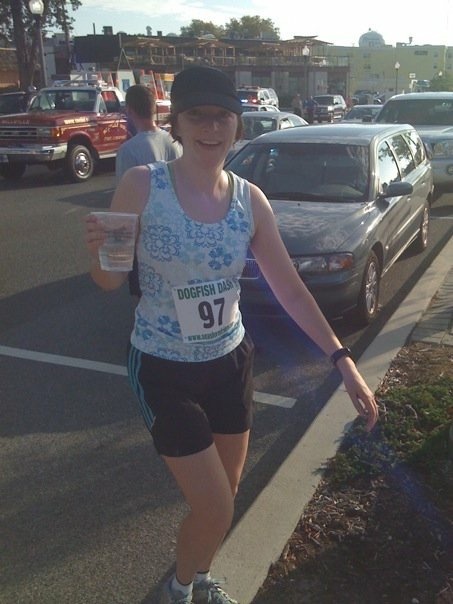 Prior to my first Dogfish Dash, I was a novice runner who could barely manage a few yards without stopping, though I was a keen and seasoned beer drinker. 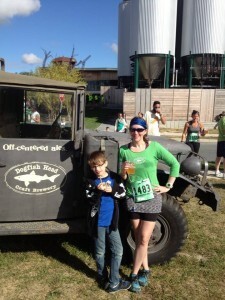 But after that first race, it became an annual part of my calendar, and I began signing up for other, longer races, just to be ready to run a ‘good’ (by my standards) Dogfish Dash – anything that would make my wait in the beer line shorter. I began doing all sorts of other fitness-related things that would have shocked and horrified my teenage self, but it has always paid off – I’ve exceeded my 10K PR each year in the Dogfish Dash, and I can’t avoid setting a PR (personal record, for all you couldn’t-care-less-about-weird-runner-jargon folk) for this new, ‘off-centered’ distance. And while I’m still not back to my pre-this-baby speed, and I realize that calling what I do ‘speedy’ would inspire laughter with certain stripes of runners who take things a bit too seriously, my prep races have convinced me it’s returning. 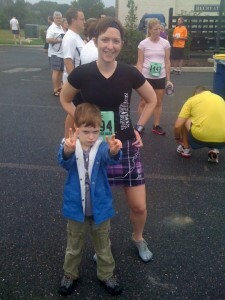 So whether it’s a stretch for someone who is just starting out as a runner (welcome – there’s beer at the end!) or a shorter race that a distance runner can use to push their pace, it’s good, well-organized fun for all. So, if there’s a moral to the story, it’s that beer is good for you, and makes you a fitter, faster runner. I’m living proof. Throughout college and grad school, it seemed everything was post-something. As a student of archaeology, that meant for me, largely post-structuralist, post-feminist, post-processural and the like; fast-forward 20 years, and Jeff Pickthall muses about whether he might be ‘post-craft’ when it comes to beer. 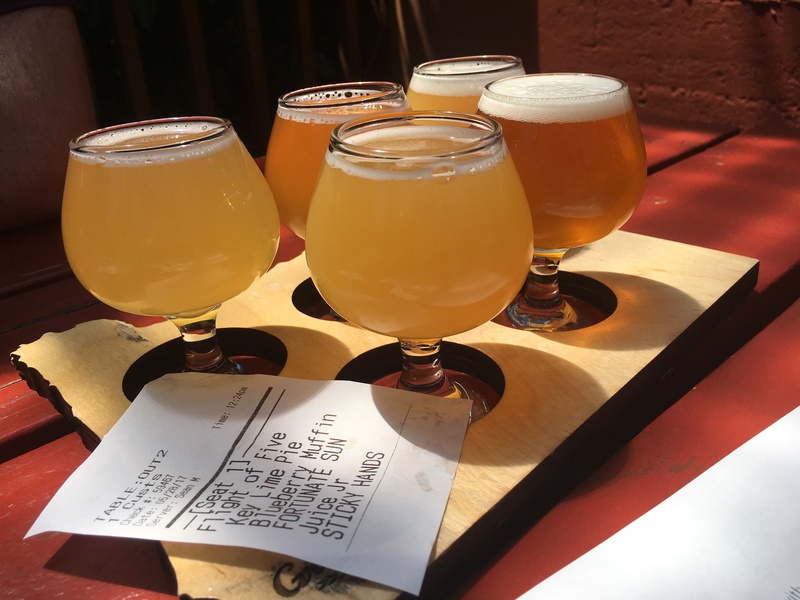 It’s a perspective I’ve been wondering about of late, albeit without a clever title – while the explosion of an amazing array of breweries and styles has largely been a positive thing, there is more than a whiff of Shiny Object Syndrome in the beer world. While previously it seemed every brewery had a double IPA (or something else pushing the ABV and IBU envelopes), the current trend for ‘weird’ beers can be a bit wearying, and I say that as someone who loves them. First, though, let’s put some boundaries around what ‘weird’ is for the purposes of this discussion. Some of it is reviving (or simply re-discovering) historical and regional styles like Kentucky Common or Gose (now NEW YORK TIMES APPROVED), and that’s great, though I’d love to see more done with the rigor employed by Ron Pattinson’s work with primary sources – there’s clearly a lot of room for variety in those historical styles, often much more than one would assume, and it’s fabulous to see (drink) the results of that kind of work. But there’s also a tendency to ‘modernize’ them – making a 12% barrel-aged Berliner Weisse comes to mind – in ways that aren’t just historically inaccurate, but simply don’t appeal to anyone beyond a particular kind of fanboy/girl who may simply be in it for the bragging rights. It’s perfectly fine to make things that aren’t for everyone, but if it’s something even that narrow audience professes to enjoy simply because they feel they ought to, there’s something missing. 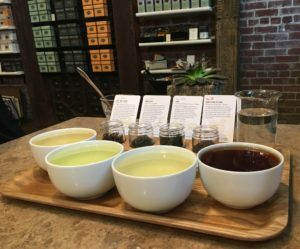 There’s another branch of ‘weird’ that uses unexpected ingredients, and that can work extremely well, but that doesn’t mean that it will. It could be a huge failure. Or, perhaps even worse by some standards, it could just be thoroughly mediocre. And it’s fair to say that a wider acceptance of ‘weird’ also leads to more room for error – maybe that infected beer that cost a lot to make is just a new kind of ‘sour’ (which now seems to cover a very wide stylistic range indeed), and it can be repackaged or rebranded as such. That’s where things start getting sloppy, and over time, people notice. That’s not to say there aren’t breweries doing weird beers extremely well; I’m very fortunate to live a short walk from Tired Hands Brewing Company, and they have yet to turn out a dud, but their smaller-batch model is perfectly designed for that sort of experimentation by highly-skilled brewers. And Tired Hands has also made great milds, a fabulous bitter, wonderful IPAs – it’s just that for them, those are the rarities. And because the quality and consistency is there, it works. Mikkeller has a similar, if somewhat more scattershot approach, likely a necessity given their peripatetic brewing model, but I did find it very interesting that their pub in Copenhagen had a great mix of traditional styles, both their own beers and those of their friends and neighbors, as well as the more outlandish beers they tend to sell abroad. Given that ‘weird’ seems to sell, it’s a smart approach – keep a hand in with high-quality basics, but send the ‘extreme’ things to the markets that crave them (though I’d personally love to have some of their beers that I tried in Denmark in the US – do I get any pull as a member of the Mikkeller Running Club? No? That’s OK). There are other breweries I’ll not name that desperately want to be ‘weird’ and to that end, only brew beers with, say, vegan bacon as a key ingredient, but they don’t seem to have mastered the basics. 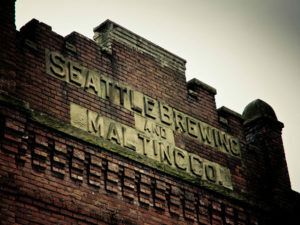 Those are the breweries that look uncannily like those that didn’t survive The Great Microbrew Bubble in the 1990s. There are certainly times when I really want to try the Shiny New Thing – but equally, there are times when I wish I could find more great, well-brewed ‘normal’ beers – especially with a lower ABV (hey, I’m only small, and having one child who is under a year old means I’m a long way off from having any alcohol tolerance back). 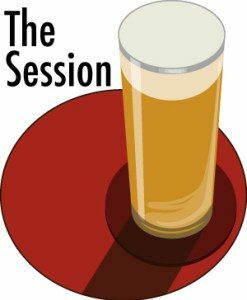 But instead of ‘session IPAs’ – the best I’ve had have been perfectly well-crafted and re-branded pale ales, with the worst tasting rather like hop tea – can we not enjoy a range of other styles? I have been thrilled to discover Conshohocken Brewing Company’s Puddlers Row Bitter; it’s perfectly done, and a great go-to beer. But in the current environment, I’m sometimes told the ‘normal’ beers aren’t selling; I was pleased to discover my local beer shop had begun to stock some Hobson’s beers, but then crestfallen to hear they were selling them all cheaply because ‘they didn’t move.’ There can be any number of reasons for this, but given that I was actively keeping an eye out for those beers and didn’t know they were there, I can only imagine how hard it would be for someone who hadn’t heard of the brand to discover them. A small brewery that happens to make great beers isn’t memeworthy; after all, many beer snobs don’t want to drink ‘tired’ styles they associate with the Newcastle Brown they thought was pretty fantastic as underage drinkers. There’s no push within most of the craft beer-centric media (at least in the US) to talk about great ‘ordinary’ beers – novelty is what gets press. 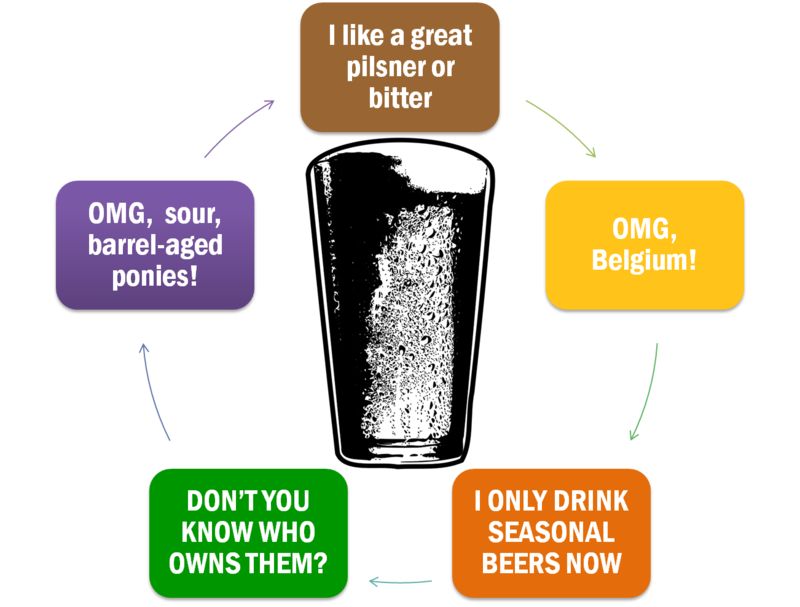 These things are cyclical, but they have a real impact on what’s available, and I suspect there is an audience that simply isn’t catered to: they don’t feel the need to identify as a ‘craft beer person,’ but they’d like to try something new that isn’t too far from their comfort zone. 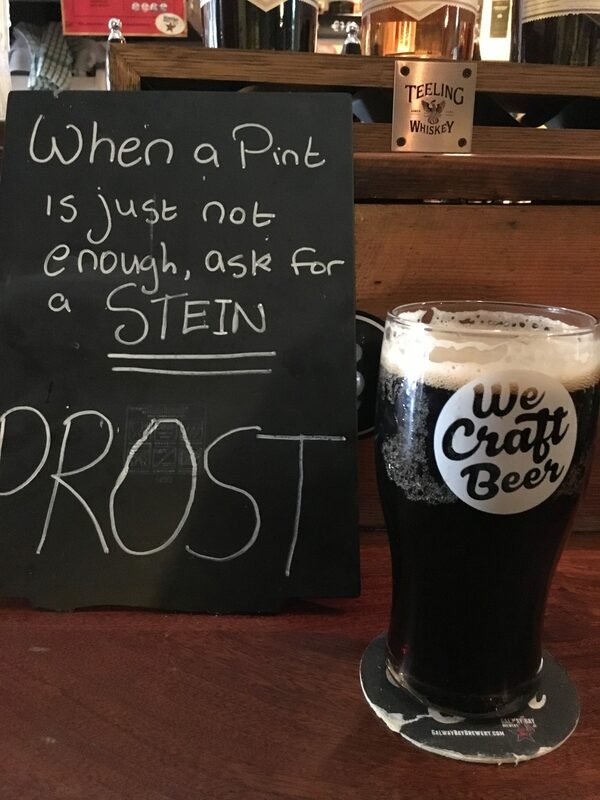 On the other side of that coin, there are more and more craft beer nerds who know the value of a great ‘normal’ beer and wish there were more of them about. 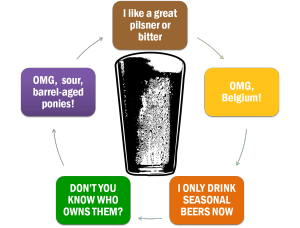 So perhaps it’s not that I’m post-craft, but that I’m at a different phase in my personal craft beer cycle, which seems to run a bit like the image above. 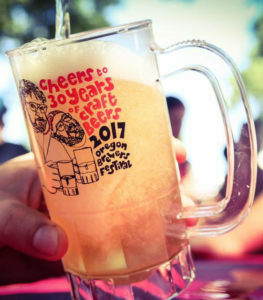 There are a few sub-processes and tangential directions left off, ranging from ‘I don’t drink contract-brewed beer’ to ‘I only drink beers for which I need to buy tickets and/or stand in line for hours’ on one side of the circle, with the other turning toward ‘I drink anything that’s free at a tailgate.’ It’s OK to have gone around the cycle a few times. It’s OK to go back and forth on different points on the cycle, or to decide you’re quite happy in one particular phase. 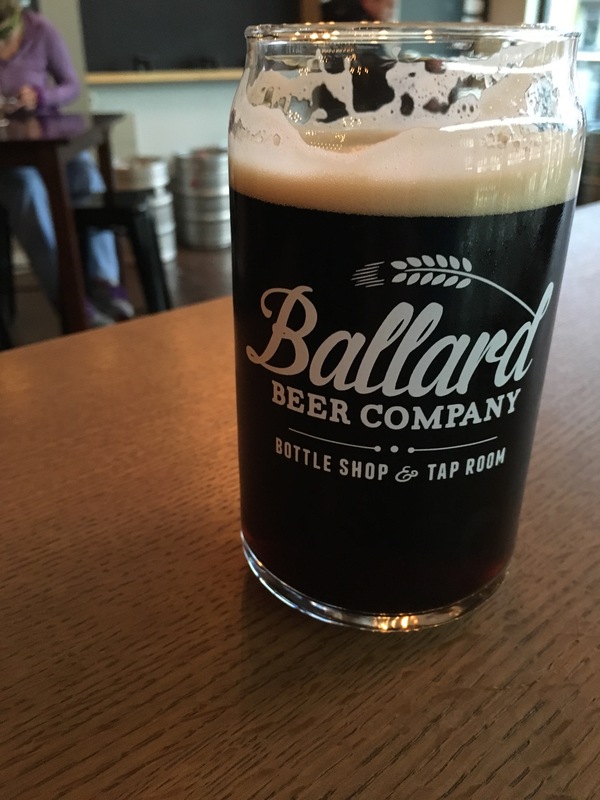 It’s a fabulous thing that I can walk a few blocks to have a great beer whenever the mood strikes me (provided I’m not at work, too tired, that both the big kid – who is something of a brewery tour snob – and the baby are both fed and watered, or that cats aren’t sitting on me). I’m thrilled that I can always find something unexpected and well-made, but sometimes I’d just like (the equivalent of) a pint of Theakston’s Best. This month’s Session – or, Beer Blogging Friday – asks us to identify those under-the-radar locations that are about to become the next big thing on the beer scene. This presents an ideal opportunity to finally blog about our trip to Copenhagen in 2013; yes, this blog post is nearly two years late, but better late than never, and a wider audience should be aware of the wonders of the Danish capital’s beer scene, both old and new. When considering Copenhagen, most beer nerds immediately think of Mikkeller, and with good reason – Mikkel Borg Bjergsø’s steady march to beer omnipresence, with bars and tasting rooms from San Francisco to Bangkok, and a global distribution network that some brewers with a permanent facility can only image, has been remarkable. 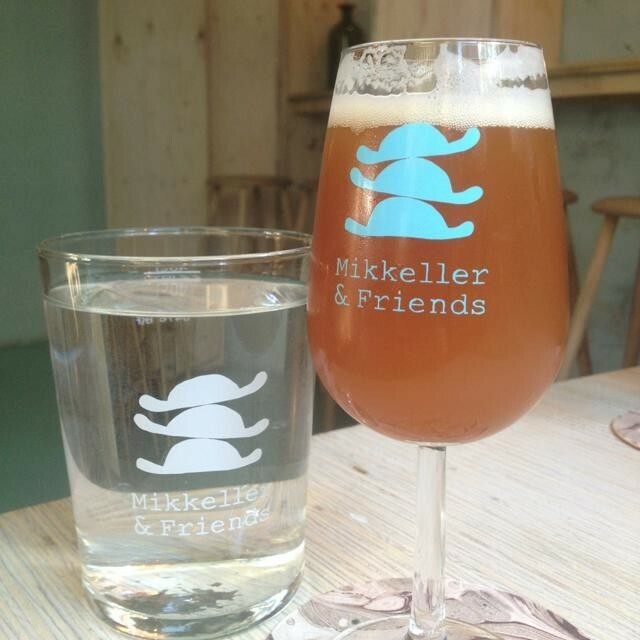 And their original Copenhagen locations do not disappoint: especially at Mikkeller & Friends, in the Nørrebro neighborhood, you’ll find a warm welcome, and an ever-changing lineup for 40 taps. 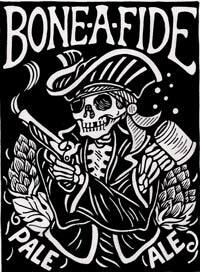 I would love to see more American breweries follow their ‘and Friends’ approach, which they take very seriously, highlighting not only Mikkeller beers, but also those of like-minded breweries from near and far. When we visited, we enjoyed having the opportunity to sample the wares of To Øl, Herslev Bryghus and Bryggeriet Refsvindinge, among others. And, this being Denmark, having a well-behaved child in tow was not frowned upon; quite the contrary. The bottle shop attached to the bar had an enormous crate of Westvleteren XII sitting in the corner – as you do – and a very interesting selection beyond that. Nørrebro is also home to Nørrebro Bryghus, whose beers are available across Copenhagen, from restaurants to tourist attractions. It was an especially welcome discovery at the National Aquarium of Denmark, Den Blå Planet: you can enjoy a beer or two while taking in the view of the Øresund. Amager Bryghus beers are also widely available around the city, and Brewpub København was worth a quick visit. No list of Copenhagen tourist attractions would be complete without a mention of Tivoli Gardens, which we found a most pleasant surprise. Having previously only visited rather uninspiring to downright filthy theme parks in the US and UK, I admit I didn’t expect much, but it was in every way delightful – and it has its own small brewery, Bryggeriet Apollo, in the park. While the beer in general is nothing earth-shattering, nor did it have any reason to be, it was certainly well-crafted and offered at a not-unreasonable price, given the surroundings (and the fact that food and drink in Denmark is quite expensive, compared to other major European countries). 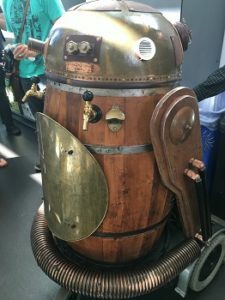 Modern amusement parks could learn a lot from their 19th century forebear – good food and drink, lovely gardens, fun rides without long lines, and Tycho Brahe as a mascot, rather than cartoon characters – all well worth the price of admission. Returning to bottle shops, Ølbutikken is a can’t-miss stop; Jeppe Jarnit-Bjergsø and his staff have a well-curated collection of beers from around the world, though obviously with an emphasis on the owner’s Evil Twin Brewing. And for those wondering whether the purported feud between the rival gypsy-brewer twins is A Real Thing, I can only offer this: Mikkeller & Friends had a number of interesting Evil Twin beers on tap, and Ølbutikken carried a good variety of Mikkeller beers. A little public friction is no doubt good for business, or it may be that Danish practicality overrides any present animosity; one presumes the truth is somewhere in the middle. But brewing in Copenhagen isn’t just about gypsy brewers and tiny breweries – there’s a good case to be made for saying that this is where modern industrial brewing was born, and that isn’t necessarily a Bad Thing. Emil Hansen first began to culture yeast for Carlsberg in the 1880s, laying the groundwork for brewing as we know it today. 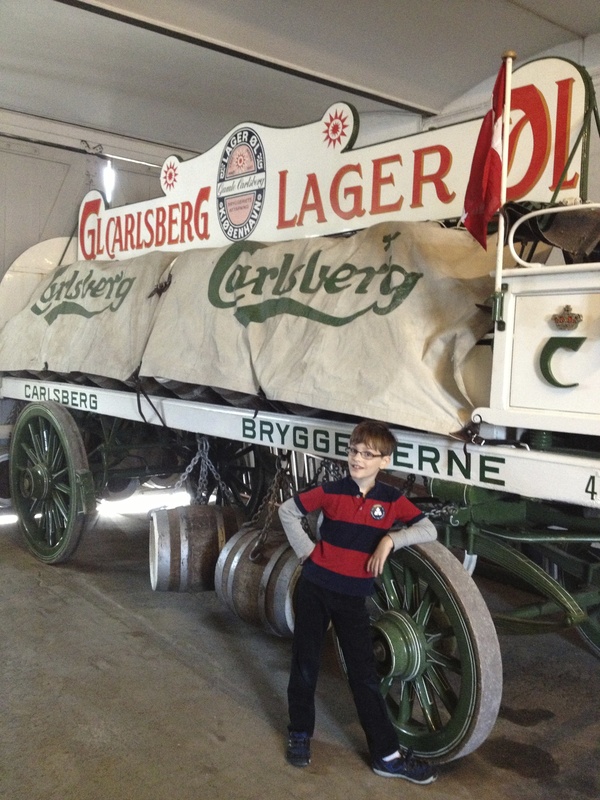 And the Carlsberg tour is absolutely a highlight for anyone interested in brewing history, and in considering how huge, multinational brewers can still make ‘good beer.’ Again, children are made to feel very welcome – the tour starts in the stables (or in the shop, depending on your point of view), and petting the Jutland horses, who have been carrying Carlsberg beer for more than 165 years, is encouraged. From there, it’s a whistle-stop tour though the old brewhouse, complete with beautiful tilework and copper kettles galore, to the famous Carlsberg Elephant Gates (with their 1901 swastikas fully explained, for the benefit of any children, or adults who might have missed some art history lessons) and sculpture gardens. And the tour concludes with a mix of old and new, in the Jacobsen Brewhouse, named for J.C. Jacobsen, the founder of Carlsberg. Since 2005, Carlberg has been brewing a range of high-quality beers under the Jacobsen label, and mixing and matching Carlsberg and Jacobsen beers in your post-tour samples is encouraged. There’s no ‘craft vs crafty’ issue here – Jacobsen is very clearly part of the Carlsberg family, and a well-respected one at that – it’s just a great example of how a large brewer can respond to market demand for more flavorful, complex beers, all while keeping their flagship brands in the public consciousness. There is, of course, much to do in Denmark beyond beer – visiting the Gundestrup Cauldron at the National Museum of Denmark was the achievement of a major life goal for me (this comes of having too many archaeology degrees), and the Viking Ship Museum in Roskilde is also a must-see (though it is worth noting that both sites have some of the above-mentioned beers available in their shops and cafes). There are ample opportunities to visit a number of bog bodies across the country, and if you’re traveling with children, your itinerary will almost certainly include a visit to Legoland – which, like Tivoli, albeit with much more plastic, is surprisingly diverting for adults as well. But if you seek a great beer destination that hasn’t quite been discovered by the hipster masses, head to Copenhagen; its mix of young, independent breweries and historic heft is hard to beat.